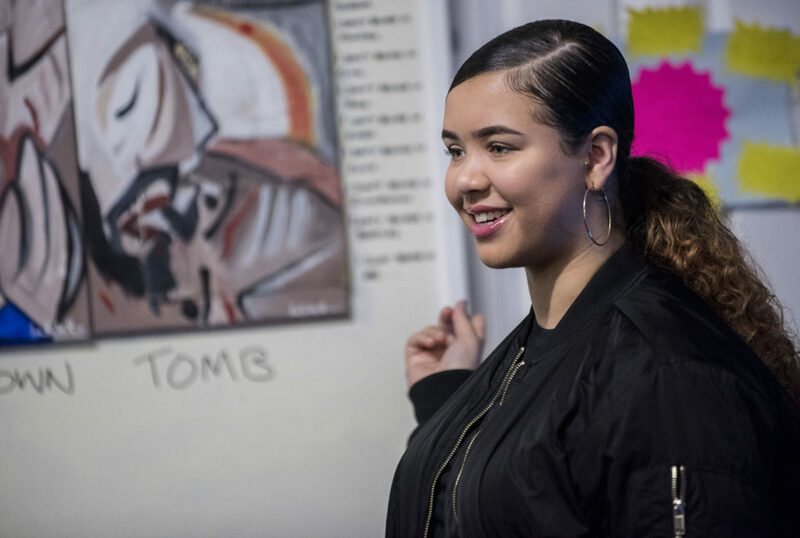 For twenty years, Contact Manchester has given agency, responsibility and skills to young people, using performance and theatre as a force for social change and artistic empowerment. The direction and key management decisions (including all staff appointments) of Contact are shared 50/50 between adult and young people’s leadership panels. For every major department within the organisation, there’s a young people’s sub-group, with the express purpose of developing the participant’s expertise: I:Con (marketing), Re:Con (programming) and Con:Struct (capital projects). The shared leadership model applies to Contact’s governance too, with young trustees having full board responsibility. It might not always be easy: CEO and Artistic Director Matt Fenton concedes that this level of inclusion brings complexity, and can slow processes down, but the model ensures decision-making is relevant and grounded in Contact’s audience. Young panels are unlikely to be impressed by name-dropping and may push interview candidates out of their comfort zones, asking them, for example, to summarise their career in spoken word. However, it is these differences that help Contact stand out from the crowd. Matt emphasises the ‘conventional underpinnings’ of Contact business model despite their innovative governance model, ensuring their mission is delivered with purpose and efficiency. Matt sees no conflict between Contact’s approach and artistic quality: ‘Our strength is in the facilitation, development and empowerment of our young people’. Contact favours long-term relationships with its participants and partner artists, and their process of development with Contact makes them skilled and experienced by the time they’re creating significant artistic outputs. Joining a ReCon (young programmers) meeting, I was struck by the insight, business-savvy and knowledge of the young programmers as they showed a critical awareness of contracts, intellectual property, budgets and artistic direction. The stereotype of ‘youth theatre’ is inevitable, but erroneous, missing Contact’s ultimate purpose of developing great professional makers of theatre, music and spoken word, that happens to start from an early age. Contact makes theatre about issues affecting young people’s lives: recently sexuality, gender, health, forced marriage and FGM. Their artistic output is deeply relevant to its audience and has a loyal following amongst Manchester’s theatre goers and diverse communities. The potency and immediacy of their issue-driven theatre has impacts far beyond Manchester, with three recent Contact co-productions being screened on BBCTV’s Performance Live strand and iPlayer. Re:Con is Contact’s young programmers and producers group. Typical of the Contact model, they deliver core elements of Contact’s artistic content (programming work for all its stages), and also manage their own projects, with Contact senior staff consciously stepping back, offering facilitation and guidance. Temporary Monument, Permanent Protest is one of a series of interventions celebrating the 30th anniversary of Manchester’s Section 28 protests. Re:Con successfully applied for Arts Council funding and delivered all aspects of the project, from artistic direction to budget management. This model casts the young people running Re:Con as fully accountable for their work. The senior staff prompt reflection, ask questions and occasionally challenge ideas, but never seek to change the creative or practical direction of the project. For Contact, its building has a central role in the delivery of its purpose. “It’s a touch-point, a place to feel welcome, respected and supported.. We ensure the environment we create is as welcoming and open as possible”. The perception amongst Contact’s young participants can be that they’re not welcome in public buildings, that it’s only a matter of time before they’ll be asked to leave. The Contact team consciously break these perceptions, bringing team meetings into public spaces and creating an informal, inclusive culture. “If a young person knocks on a door, they know someone will help”. Contact was starting a major building project at the time of writing. The architects have been brought into the Contact approach, with a young persons’ panel having equal weight in their appointment and are shaping the project brief. Openness and inclusivity is designed into the new spaces, with additional capacity to nurture skills in a broader range of performing arts, including music, cabaret, circus and digital media. Matt views Contact’s Arts Council National Partner Organisation (NPO) status as pivotal “We’re physically a small venue, only 300 seats, and have a high subsidy to turnover ratio: for me the breadth and scale of our funders are a clear recognition of the broader purpose and value of Contact”. The shape of Contact’s team is atypical too, with more staff involved in participation than traditional programming and show delivery. Contact’s approach has the endorsement of a range of funders. Wellcome Trust have funded a significant new space within the transformed Contact building, as well as a new health producer post, recognising the potent intersection between performing arts, health and wellbeing. Public Health England are funding a show currently in development exploring late-diagnosis HIV in diverse communities.